Igor M. Samokhvalov, Ph. D.
Dr.Samokhvalov received PhD in molecular biology from the Engelhardt Institute of Molecular Biology, Russian Academy of Sciences, Moscow, in 1998. From 1995 till 1997 he worked as a visiting scientist in NIH/NIAID, Rockville, MD and New York Blood Center, NY, USA. His postdoctoral training started in Edinburg University, UK, in 1998-2002, then he moved to Center for Developmental Biology, RIKEN Kobe, Japan, and worked there first as JSPS Fellow (2002-2004), then as Research Scientist and PI (2004-2012). 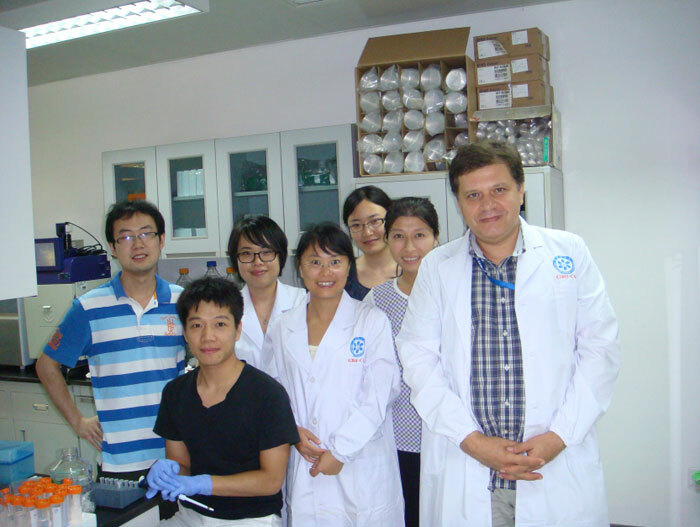 In April 2012, he joined GIBH CAS and set up the Laboratory of HSC (Hematopoietic Stem Cell) Development. In 2013 he was selected as a nominee for the Guangdong Leading Talent Program. Currently, there are five Research Assistants (1 M.D. and 4 M.Sc.) working in the laboratory. 1. Studying the process of directed hematopoietic differentiation of mESCs, hESCs and hiPSCs. Establishment of cellular dynamics of hematopoietic differentiation using multiple long-term genetic cells tracing methodology. 2. Development of efficient protocol for derivation of mature cell types (erythrocytes, platelets), hematopoietic progenitors, and HSCs from pluripotent cell sources in well-defined cell culture conditions. Adaptation of the protocol for prospective genetic and cell therapy of β-thalassemia and blood “pharming”. 3. Studying hematopoiesis in early human embryo and secondary yolk sac. Focusing on VE-cadherin-positive early hematopoietic progenitors in the yolk sac. 1.Samokhvalov, I. M., Samokhvalova, N. I. and Nishikawa, S.-I. Cell tracing shows the contribution of the yolk sac to adult haematopoiesis. Nature (Article) 446, 1056-1061 (2007). 2.Srinivasan, R. S., Dillard, M. E., Lagutin, O. V., Lin, F.-J., Tsai, S., Tsai, M.-J., Samokhvalov, I. M. and Oliver, G. Lineage tracing demonstrates the venous origin of the mammalian lymphatic vasculature. Genes Dev. 21, 2422-2432 (2007). 3.Gascon, E., Gaillard, S., Malapert, P., Liu, Y., Rodat-Despoix, L., Samokhvalov, I. M., Delmas, P., Helmbacher, F., Maina, F. and Moqrich, A. Hepatocyte growth factor - Met signalling is required for Runx1 extinction and peptidergic differentiation in primary nociceptive neurons. J. Neurosci. 30, 12414-12423 (2010). 4.Ginhoux, F., Greter, M., Leboeuf, M., Nandi, S., See, P., Gokhan, S., Mehler, M. F., Conway, S. J., Ng, L. G. Stanley, E. R., Samokhvalov, I. M. and Merad, M. Fate mapping analysis reveals that adult microglia derive from primitive macrophages. Science 330, 841-845 (2010). 5.Tanaka, Y., Hayashi, M., Kubota, Y., Nagai, H., Sheng, G., Nishikawa S.-I. and Samokhvalov, I. M. Early ontogenic origin of the hematopoietic stem cell lineage. Proc. Natl. Acad. Sci. USA 109, 4515-4520 (2012). 6.Hoeffel, G., Wang, Y., Greter, M., See, P., Teo, P., Malleret, B., Leboeuf, M., Low, D., Oller, G., Almeida, F., Choy, S.H.Y., Grisotto, M., Renia, L., Conway, S.J., Stanley, E.R., Chan, J.K.Y., Ng, L.G., Samokhvalov, I. M., Merad, M. and Ginhoux, F. Adult Langerhans cells derive predominantly from embryonic fetal liver monocytes with a minor contribution of yolk sac–derived macrophages. J. Exp. Med 209, 1167-1181 (2012). 7.Samokhvalov I. M. A long way to stemness. Cell Cycle 11, 2965-2966 (2012). 8.Samokhvalov I. M. Return to the hematopoietic stem cell origin. Cell Regeneration 1: 9 (2012).